There has been an amazing response so far to our latest art competition, but more entries are desperately needed. The competition itself has been organised by High Wycombe Bee Keepers Association who visited Year 3 back in May. As an Association their key role as a charity is to promote beekeeping through annual beekeeping courses and educational visits to schools. 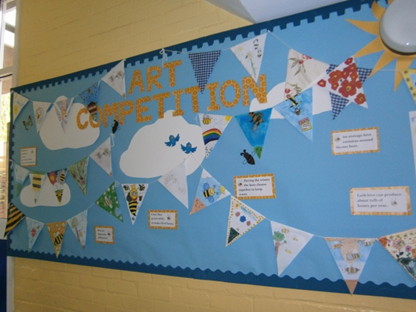 We have joined many other local schools in designing the bee bunting for their Autumn Gathering in October. The winning entry will get a selection of bee goodies as well as a class visit from the education’s team who will bring along lots of bee related resources as well as an observation hive containing live bees. If your child has not yet entered and would like to, there are more templates available just find me at break time. The last day to enter is Friday 4th October 2013.